1733 Emerald Beach is a beautifully decorated gulf front one bedroom two bathroom modern oasis. Great pride has been taken to offer the this unit with update appliances and furnishings. The master bedroom has a queen size bed, and has it's own master bath. This unit will sleep up to five guests as they also have a day bed in the hallway. There is a second bathroom for guests use with a gorgeous walk in shower. The living room has comfortable furnishings with a modern appeal, the couch converts into a full sized sleeper sofa for guest use. The kitchen is fully equipped ready to meet your needs for a full dinner preparation or quick snacks. For your convenience there is a washer & dryer. 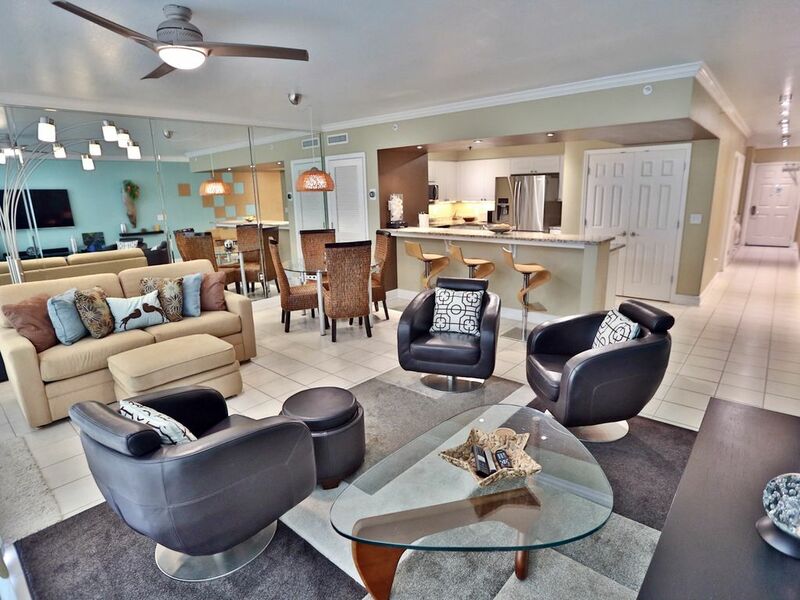 This condo will make your vacation last forever in your fondest vacation memories. This vacation rental is professionally managed by Blue Sun Properties. We aren't like other rental management companies; we are vacation property owners too and we understand the investment made and the desire to maintain our beautiful vacation homes. On the flip side, we were vacationing guests here for years and understand what our guests have come to expect from a top-notch rental management company. A limit of 2 parking passes/vehicles per unit. Beautiful beach condo in a great location. This beach condo has an amazing ocean view. Sitting on the balcony is breathtaking. Comfortable accommodations that make you feel at home while you are there. Walk to local pubs, eateries and Pier Park. Fitness center is nice. Looking forward to staying here again. The condo was so nice right on the Ocean. Updated, clean,convenient. Restaurants and convenience stores and Starbucks within walking distance. A little deli and bar located on premesis. 1mile from the pier and shopping. This property was beautiful. I would stay again and again. Wished we had more time to enjoy it. So nice! The view was amazing. Condo was in a great location. The condo was in a great location. Very close to pier park & sharkeys. The view was amazing and condo was well kept. Definitely recommend to anyone wanting a good getaway. Clean, comfortable and very well furnished all at a fair price. This place had everything I needed and a whole lot more.